Located just outside Winthrop in eastern Washington, the site for these two cabins lies in the Methow Valley. Nestled in the foothills of the North Cascade mountains, the dramatic views from the site and opportunity for year round recreation drew our client to this region. A strong relationship to the site topography and varying climate was key to the design of both cabins. The initial scope for the project was to design a two bedroom cabin which maximized the connection to the surrounding natural environment and outdoor living. This cabin would initially serve as a weekend retreat from the city, and later become a permanent home. Our client wanted to create an efficient floor plan for the house, with open interior/exterior living, bedrooms above, and garage below. It was important to use durable materials throughout the exterior of the cabin due to the extreme climate and fire hazard in the area. The upper levels of the cabin sit on a concrete plinth which forms the garage. 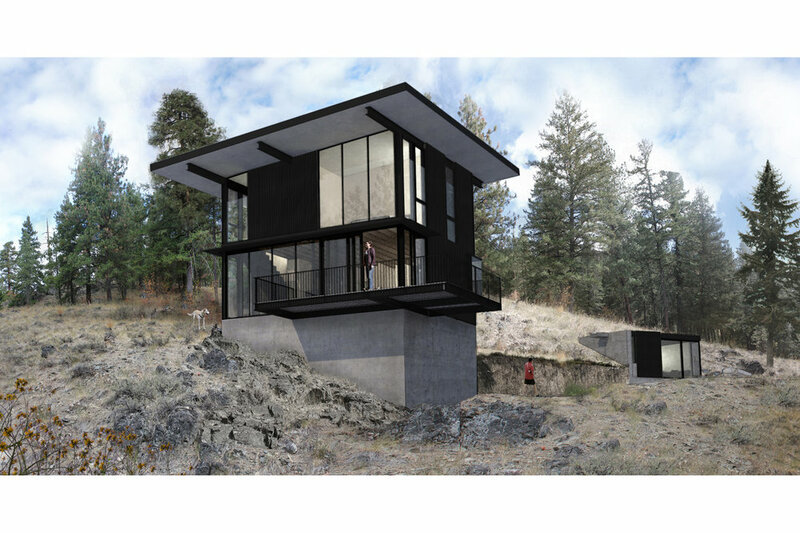 Concrete is used to both ground the cabin and retain the natural slope of the site that the cabin sits in. Above, black corrugated metal sheets are used as an efficient and weather resistant siding material. A shed roof with large overhangs on all sides protects the cabin from the heavy winter snowload. A large cantilevered exterior deck opens out from the main level, vastly increasing the living space in the summer months. Views from the deck capture the surrounding mountain ranges and natural beauty of the site.